Diamond Chef 2014 winner Marc Guizol (center) with sous Zachary Pullam and Adrienne Rogers. 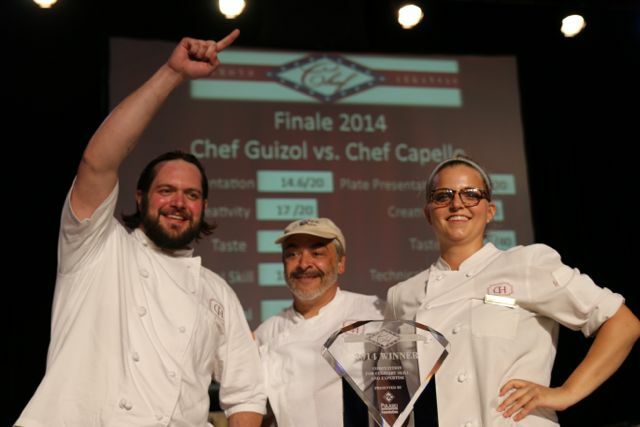 Chef Marc Guizol, sous chef at the Capital Hotel, has won the 2014 Diamond Chef final competition. 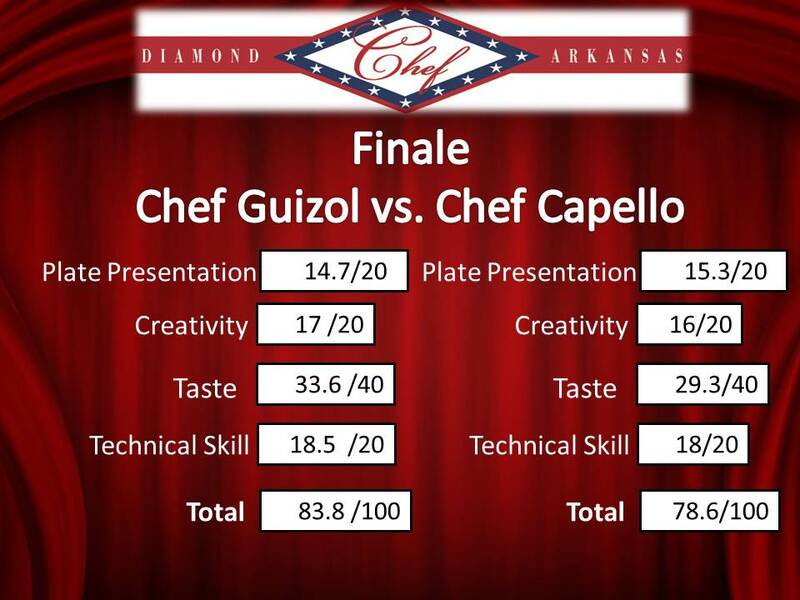 His competitor was Chef Dan Capello of the Chenal Country Club. 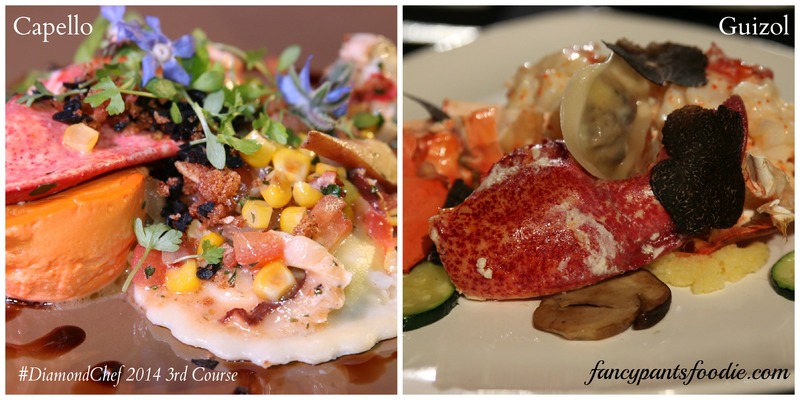 This year’s secret ingredient was lobster, and Guizol and Capello did not disappoint with their variations on the theme. However, before the ingredient was revealed, an even bigger twist: Each chef had to trade one sous chef to the opposing team. Chenal’s Patrick Kelly ended up working with Guizol, and Capital Hotel’s Zachary Pullam switched over to Capello. Each team was given 20 minutes to prepare each course, which was then presented to the team of judges. 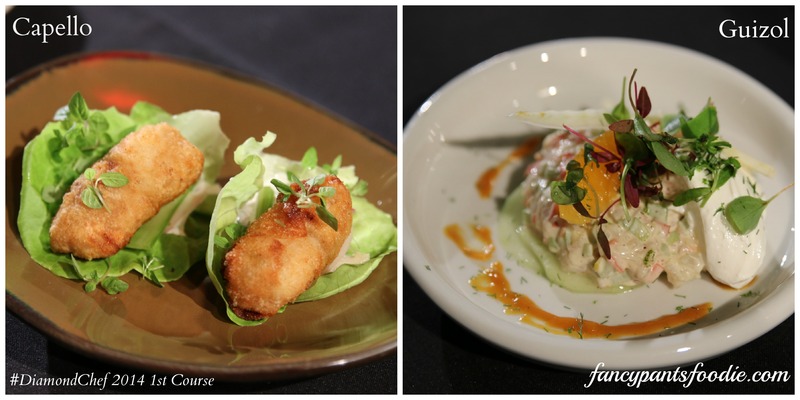 Chef Capello’s team presented a lobster spring roll with a lemon sour cream sauce. Guizol’s team presented lobster tartare with a peanut butter sauce. Capello presented a crab claw and knuckle ragu with mushroom, tomato and bacon; a corn and lobster flan; and a celeriac, French truffle and quail egg yolk ravioli with a celeriac truffle crumble, garnished with thyme, celery and borage flowers. Guizol presented a smoked lobster claw with roe presented caviar style, a fresh winter Australian truffle ravioli with foie gras, and porcini mushroom garnish. Guizol won with a final total score of 83.8 out of a possible 100 points, compared to Capello’s 78.67 points. I got to overhear some of the judges’ conversations while taking photos and getting plate descriptions, and the competition was tight. It seemed to come down to a few minor technical errors on Capello’s part and more well-executed dishes on Guizol’s side. I don’t envy the chefs or their sous at all. This is an extremely high-pressure event, and I certainly would not want to pick apart each dish like the judges must. They are presented with near-perfect dishes from Arkansas’ best chefs, and they are forced to find what little things may have been wrong. 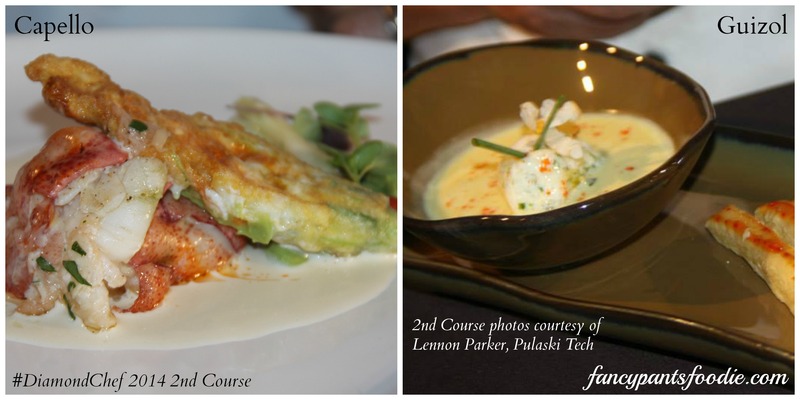 Once again, Diamond Chef has shown us just what amazing culinary talent we have right here in Arkansas, all benefiting Pulaski Technical College’s Culinary Arts and Hospitality Management Institute so they can keep adding more talent to our market. PHOTOS: See below for candid shots and more from the event. Please do not republish without permission. You got our names back words. Patrick works at chenal and I'm at the capital. Confusing, I know. Ack, sorry about that! Yeah, the whole thing was confusing! Will fix right now.